Mexico is facing two communist infiltrated mass revolutionary movements, the "Broad Progressive Front" of failed presidential candidate Lopez Obrador and the Zapatista dominated "Other Campaign". Both want to bring Latin American socialism to the US border. MEXICO CITY — The Zapatista Army of National Liberation Army (EZLN) has vowed to continue its campaign to change Mexico’s political and economic system. The Zapatistas, as part of a larger movement known as “The Other Campaign,” say that they will renew their efforts to organize “a civil and pacifist insurrection” across Mexico to transform the country’s political and economic system. The Other Campaign is a loose coalition of individuals and groups that includes the Party of Mexican Communists, one of the country’s left-wing parties. The primary goals of The Other Campaign are to abolish capitalism, which it says has led to widespread poverty, and to dismantle the country’s repressive political system. According to EZLN leader Subcomandante Marcos, in a recent interview posted on the web site Radio Zapatista, while armed struggle to change the economic and political system is still an option, The Other Campaign has ruled this out. He predicted that the Zapatista-led campaign could succeed in transforming Mexico before 2010. Zapatista commanders, including Marcos, have launched a new tour of Mexico to build opposition to the government of President Felipe Calderon. 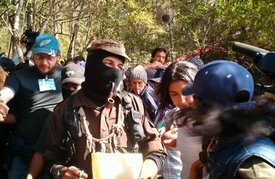 The EZLN is also initiating a solidarity campaign, in Mexico and worldwide, with the indigenous communities in Chiapas, an impoverished state in the country’s southeast. After Andres Manuel Lopez Obrador’s center-left movement, The Other Campaign is the second largest opposition group working for change in Mexico. However, both movements are bitterly opposed to each other. During the 2006 election campaign, Subcomandante Marcos toured the country urging people not to vote for either the National Action Party (PAN), the Institutional Revolutionary Party (PRI) or Lopez Obrador’s coalition For the Good of All (now called the Broad Progressive Front). Marcos charged that Lopez Obrador and his coalition, if elected, would pursue the same right-wing policies implemented by PAN and PRI. As a result, a bitter rift has emerged between supporters of the EZLN and Lopez Obrador, some of whom charge that Marcos helped PAN and PRI secure more votes by encouraging people who might have been inclined to vote for the left to abstain from voting. Given the history of election rigging in Mexico, The Other Campaign refuses to take part in electoral politics. The Zapatistas and the "splinter group" are being backed by Fidel Castro. I would assume now that Castro has found oil and is planning to be enriched with it, the Zapatistas and the "splinter group" will receive arms from Castro along with his protege Chavez who they have also supported as well. You kiwi guys have nothing to be proud of, you treat women in this country like crap.